China’s booming digital economy has seized global attention over the last decade for its rapid growth, unique online landscape and the rise of domestic online giants such as China’s major search engine, Baidu. The sheer scale of China’s population alongside ongoing socio-economic factors mean that its significance as an online market continues to evolve. China’s middle class for instance recently overtook the US to become the largest in the world. In terms of internet penetration, despite more than half of the Chinese population still not having access to the internet, there are over 667 million online users in China. To put this into a global perspective, this is more than the next three markets (United States, India and Japan) combined. These dizzying numbers have seduced many Western brands into attempting a Chinese market entry. When attempting to reach Chinese consumers online however, marketers often encounter difficulties in succeeding due to their unfamiliarity with the local platforms. Since Google left China in March 2010 the importance of market expertise has only grown in significance. Baidu is the dominant search engine in China, and therefore a brand’s ranking on this search engine is crucial in helping Chinese customers to find the brand’s website and offering. Ranking factors and their respective weighting of importance differ on Baidu in comparison to Google and a distinct strategy is required to succeed. There are a number of key reasons why SEO on Baidu can be challenging and this article will attempt to explore these issues. Many of the difficulties surrounding SEO on Baidu stem from the general lack of understanding that exists outside of China regarding how the search engine differs to Google. Baidu has historically been reluctant to reveal much information on its ranking factors, and there is therefore no comprehensive list for search engine marketers to follow. From what we can measure and observe, there are several major differences in how important specific ranking factors are between these search engines. However, with no official confirmation, denial or clarity from Baidu, SEO marketers never truly ‘know’ and are always having to make educated ‘best guesses’. 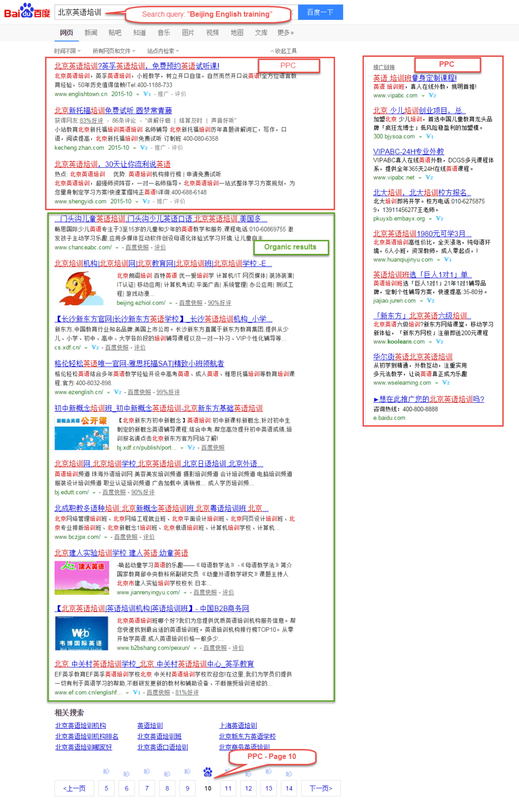 Baidu Weight is an accepted SEO metric for many (if not all) Chinese webmasters. This metric takes the form of a number between 0-9 and was introduced by several popular SEO tools and sites used in China. One way of thinking of Baidu Weight is that it’s the equivalent of Domain Authority (DA) by MOZ in China. However, this metric has several serious flaws that mean it can only ever be used as a rough estimation. This metric has taken some common SEO elements into consideration, e.g. domain history, number of URLs, internal/external links, number of indexed pages, frequency of content, etc. However, much of its focus is based solely on traffic estimations. As a result, this metric can actually be open to abuse because of its simplicity. The higher the number of popular keywords on sites, the more ‘estimated traffic’ it will appear to receive based on search volumes from Baidu Index. Both the estimated search volumes and keywords on site are therefore potentially open to exploitation if sites wish to appear to be more authoritative than they actually are. To make up for this unreliable key metric, it has become a common practice for sceptical webmasters to assess a website based on a whole range of factors, i.e. domain history, Alexa, daily site traffic by IP, number of indexed pages, number of subdomains, link profiles, ICP license, Baidu Baike entry, number of mentions in Baidu news feeds, etc. This method requires some local knowledge and experience, and also means an increased daily workload. This extra work is a good safety measure however and offers a level of protection in the long run. Link-building has long been a fundamental aspect of SEO strategy and a daily task for many webmasters in China. Approaches to link-building were often ‘black hat’ in China before Baidu started following the example set by Google’s Panda and Penguin updates. Several recent updates from Baidu cracked down on these activities by lowering the value accrued through links, and also issuing ranking punishments for sites it judged to have engaged in questionable link-building practices. In turn, another black hat practice then emerged that saw marketers deliberately targeting competitor sites with low quality links. The idea was to lower the quality of their link profile and maybe even get them penalised. The alternative daily task therefore became looking for any bad links that had been pointed to your website and manually submitting them to Baidu. Thankfully, Baidu removed this submit feature in a recent webmaster tools update and now disavows these links automatically, providing that you trust that the algorithm does this accurately. As a result of the above, evaluating the suitability and quality of partner sites has become a major aspect of link building. It can be difficult to assess both whether a site is being penalised and how to accurately judge the value of creating the content required to earn the link. With link equity becoming less predictable, the value of spending time engaging in trying to win links outside of extremely well regarded and popular websites also becomes a larger question. Google has previously stated that the sharing of content on social media sends out a signal of good user experience and as a result, interactive on-site activities and sharing on social are positive factors for ranking. However, we have yet to see any clear evidence of the same factor being relevant in China. The environment for brands looking to aggressively market on social media is also different. Chinese users are generally more reluctant to make comments online, click likes, or share content on social media. It is also not out of the ordinary to see cynical comments rather than positive ones under articles if they are perceived as disagreeable. Controversy and viral marketing are generally regarded in China as risky strategies with the potential to backfire. Managed effectively, social can of course be a key marketing channel in China, but it’s specific impact on SEO is minimal at this point in time. Marketers that work with SEO on Google benefit from a wide range of comprehensive tools that can make otherwise laborious tasks very straight forward. For Baidu, while there are a range of Chinese tools that can be useful for completing certain specific tasks, there isn’t one that does everything required easily and effectively. There are a handful of tools that have an English language interface although none offer the full range of functionality required to be able to use a single one for everything. This means whichever you choose to use, many tasks will have to be carried out manually and inefficiently. There also isn’t a huge amount of English language content or guides discussing Baidu SEO that can be found online either. On the one hand, many people that work on Baidu SEO don’t want to reveal the full extent of what they know because it gives away their knowledge. On the other hand, most people will also only actually know a tiny fraction of the total picture because (as discussed in point number 1), no one really knows the full picture with 100% certainty. This means that English language resources for Baidu are both short in supply and usually not very detailed. There is a feeling amongst Chinese SEO marketers that in response to the many black hat techniques that have been used in the past, Baidu would prefer brands to focus their efforts on paid search products and leave ranking decisions to the search engine. This way of thinking suggests that if webmasters can do the basic tasks like removing dead links and making the website experience smooth, Baidu will then take care of implementing ranking. To make life even harder for Chinese webmasters, Baidu now also displays its Baidu Aladdin and Baidu Zhixin results, which appear between the regular PPC and organic results. High-ranking results recently started to appear that seemingly couldn’t be explained based on what we know about how Baidu ranks content and this has largely been attributed to Baidu’s Aladdin project. Aladdin is a powerful open platform initiative to uncover and index useful parts of the hidden web and produce comprehensive and dynamic search results. We are working closely with webmasters for content inclusion to expand the utilities of the platform. For sites that Baidu perceives to be of high quality, it will enter into an agreement with them that allows the search engine to be able to populate sections of the SERP with content drawn from that site. This is comparable to how Google Knowledge Graph more recently started displaying content directly on the SERP. This was initially noted by people starting to spot organic results that appeared to be outranking them, with no identifiable reason. These incidents often coincided with the result in question being from one of the Aladdin partners. It became apparent therefore that even if your work from an SEO perspective has been flawless, you may still be outranked by content from Baidu Aladdin partners. Translating literally as “Know your heart”, Baidu Zhixin originated from the search engine’s experiment utilising big data to provide ‘suitable’ real-time answers to searches (equivalent to Google Knowledge Graph). These enhanced results are then displayed between the PPC ads and organic results. This product is currently being offered only to some of Baidu’s established clients that have large budgets invested in key industries such as Medical & Health, Education & Training, Travelling & Tourism, and Gaming. It is evident that Baidu is keen to provide users with much of the information they are searching for directly in the SERP, through the development of various products. A large proportion of the top results in the SERP appear from Baidu’s own products such as Maps, Wenku (library), Zhidao (answers), Baike (encyclopaedia), Tieba (interest-based forums), Jingyan (experiences & tips). Due to the dominance of Baidu’s own products in the SERPs, many webmasters have continued to explore ways of how these products might offer springboards to gain a competitive business edge. Baidu consistently takes steps to prevent these tactics being possible however, and so these tactics are never sustainable. This cat-and-mouse game will likely continue between opportunistic marketers and Baidu however, as long as the rewards of strong visibility in Baidu remain so high. Baidu’s development as a search engine is following a broadly similar pattern to Google’s so far in terms of algorithm development to date. SEO practitioners and webmasters need to have an appreciation for the types of ranking factors that are more or less important compared to Google, whilst also keeping an eye on new releases and developments and the wider digital landscape. The SEO ‘game’ can seem rigged against those new to the market and without a strong, established presence. Marketers need to build a full understanding of the online landscape in China to understand how they can improve. Increasingly (if you have the budget) it can pay to work directly with the major online players in China and benefit from the prominent visibility of paid products. High level content marketing will play an important role moving forward, both for keyword ranking and also as new types of results are incorporated into Baidu. The high level of competition in the market means that even for those with large budgets, out of the box thinking can pay off in getting an edge in market.